Le Parfait Paris - San Diego Dining Dish! Paris is my favorite, favorite city. I've been three (!) times, and look forward to taking my daughter there someday to see the best art in the world, the breathtaking architecture, and of course, eat the delicious food. That being said, getting to Paris is a bit difficult, particularly with an infant in tow. One of the things that I love the most about Paris is the neighborhood patisseries, or pastry shops. In every neighborhood, seemingly around every corner, pastry shops are open, offering fresh, delicious croissants, eclairs, turnovers, and baguettes (among other baked items). The pastries are magnificent, and the prices are embarrassingly low. When we visited, it was a favorite of ours to choose a new type of pastry each morning with breakfast. Another item of extreme delight was the macaron. A tiny cookie resembling a sandwich, the macaron is a miracle of baking: crisp and light of the shell-like "buns", rich and sweet in the filling. The macarons were found in the patisseries, but the best were found in the fancier tea shops with bakeries, such as Laduree or Pierre Herme. These more upscale places also served the eclairs and croissants, but they were of a higher quality with more expensive ingredients, and presented much more fancifully. When I heard that a French-style bakery had opened up in downtown San Diego, I was skeptical, but really excited. I had to check it out and see for myself if the items were anything like what I had eaten so many times in Paris. 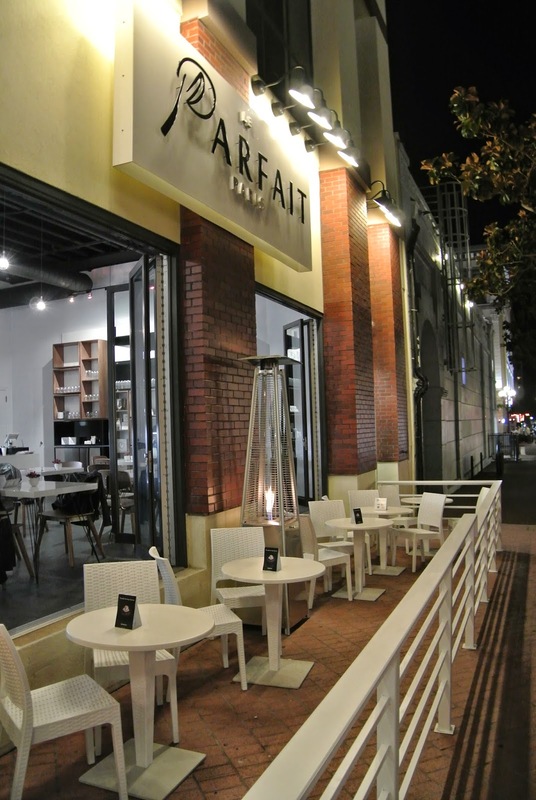 Le Parfait Paris, located right in the heart of the Gaslamp, is styled like a Parisian bistro, and serves fresh Parisian pastries and macarons, as well as sandwiches served on fresh baguette and salads. The decor is a simple, elegant black and white, which draws the diner's eyes to the pastry cabinet displaying mouth-watering croissants and eclairs. The colorful macarons are the showstopper, as appealing to admire as well as to eat. Of course, before we could consider dessert, we had to order dinner. I chose the chicken panini, made with chicken, basil, mozzarella, and tomatoes. The sandwich was delicious! The bread was perfect -- soft on the inside, with a nice crust on the outside. Steve chose the Alascian, which was a croissant with scrambled eggs, Canadian bacon, and cheese. Again, the fresh bread really made the sandwich delicious, turning mere breakfast food into something special. It was finally time for dessert, and even though there was an array of tempting items, we went with our favorites: almond croissant, chocolate eclair, and macarons. The almond croissant is just my favorite pastry. They are typically made of leftover croissants, stuffed with almond paste and sprinkled with powdered sugar and sliced almonds. This croissant was made just like the Parisian croissants that I so love. Slightly crunchy on the outside, and bursting with sweet almond cream on the inside. The eclair was made in the same manner of the pastries at the upscale places in Paris. The flavor was very complex, with a slight coffee flavor with the chocolate, and a thin bar of dark chocolate topping the pastry. Macarons were the other part of our dessert. Lemon, raspberry, blueberry, chocolate, gingerbread, and chocolate peppermint were selected. The lemon was wonderful, with lemon zest giving it a true spring of citrus flavor. The raspberry and blueberry were redolent of berry preserves, and the chocolate was a nice, light cocoa flavor. The holiday flavors, gingerbread and chocolate peppermint were spectacular! I love gingerbread, so of course I liked the gingerbread flavor -- faintly ginger, but not too spicy. The chocolate peppermint just tasted like Christmas! I can't wait to go back and try the Chausson aux pommes (apple turnover), the Mille Fleurs...everything! I'm so excited that this place is in San Diego!